This view shows Arthy’s bakers shop and the entrance to Back Lane. Next to the bakers is Angus Grant’s chemist shop. He had drug deliveries from Southend by a company called Macarthys, whose depot was just off Woodgrange Drive. They used dark green Bedford vans but the vehicle here, outside his shop, is not one of theirs. Roughtons was my Saturday job back in 1964-5. Mr & Mrs Roughton ran the shop selling spares and me and Ted were out back doing the repairs and when there were no bikes to mend there were always punctured inner tubes, as we kept a stock of spares to get folk on their way more speedily. The ancient bike stand (mentioned in Brian Meldon's comment below of 15/04/14) was in place back then too. There were also a few 'lock-ups' packed to the ceiling with spare broken bikes & motorcycles and there was an old car in another. Lovely family and a great job. Sad to leave when it came to getting full time work but I always felt welcome to return. Sorry Len, I beg to differ and stick to that original post. The bus stop was there as I used to walk up Back Lane from Oak Road and turn RIGHT at the top. I wasn't the only one to catch The Paglesham bus to school. My near neighbour John Pitts caught it too. The 7, 8, 8A did not stop there. It was only buses to Stambridge, Canewdon and Paglesham. It may have changed after 1958/9. With ref. to a bus stop outside Roughton's/The Beehive (a tobacconist and confectionery shop with a small tea room at the rear) - there never was a bus stop there, the bus stop was situated in the Square outside The King's Head Pub, this was the stop for the number 7 and 8 buses. South St. has always been a two way street. The Eastern National buses for Canewdon and Paglesham used to turn into East St. (2 way at the time) and the bus stop for both buses was outside Kings Hill. I think the number for the buses was 10 and 13 (not certain though). The school children used to sit on the wall until the bus came. When the changes to make a One Way system came about, the buses has to go straight over the junction into North St. where the bus stops for both was just past the Post Office. The route then went into Weir Pond Rd, Stambridge Rd and so on. This part of South Street is still open for two way traffic. During the 1980’s when in my teen years I worked in the bike shop when it was run by a family who lived in Canewdon. They had renamed the business Witch Cycles. At that time the long out-of-use fuel pumps were still in place in the yard out the back and in the workshop there was also lots of the older equipment still in use including an ancient cycle repair stand. The upstairs rooms had a very undulating floor and the basement was a bit on the damp side, both areas were used as store rooms. I think a problem with the structure of the floor in the shop and poor sales resulted in the termination of the lease and the end of cycle repair business. During my time in the shop I used part of my wages to purchase, in instalments, the parts for rebuilding of a handmade racing bike frame that I had been given by my father. This went on for some time, with me slowly assembling the bike over several months. I worked out that I had about a year of instalments left to finish the job, but to my surprise the shop owners gifted the completed bike to me for a birthday present in gratitude of all my work in the shop. I still have the bike and use it from time to time in the summer months. Today it is a clothes shop, but above the door the original metal mount for the former ‘Shell’ fuel sign visible in the photo above remains in use. Outside the sweetshop slighly out of shot (to left of van) was a bus stop adjacent to the then newsagent and sweetshop. This was in the days when the road was not a one way street. Eastern National ran a regular service to Paglesham which was possibly a no 11. The buses were single decker and painted in green livery. After a spell in hospital in Gt Ormond Street I travelled out to Paglesham Primary School with a few others. The bus picked up others on route. On the opposite side of South Street was a watch repairer, not sure if same shop or another, and a gunsmith too. The Bedford van is parked outside the chemists where I use to take my black and white film for development and printing. From about April 66 till about 69 I used to fill the fire engine up with petrol. Wally Roughton used to be a fireman at Rochford. The fuel pump was located in the entrance to Roughton`s yard (you can see the entrance to the rear of the van in the picture). That entrance was big enough for a cart to go through, and I think the workshops at the rear had a horse related history. I remember them being used as repair workshops for bikes. Aahh, the wonderful smell of baking bread as I walked past on a cold winters morning! I think the building the other side of the chemists was the place that sold bike spares, and a few bits of fishing tackle and bait. We used to buy our maggots somewhere along South Street just around from the square but I cannot remember the name of the shop. I have a vague (maybe incorrect) memory that there was also an old fuel pump outside it and if you look carefully it does look like the old Shell symbol sticking out from the building above the ground floor. The other baker in the town was Clements who were located in West Street. They use to have an electric van similar to those milk floats still used in diminishing numbers. 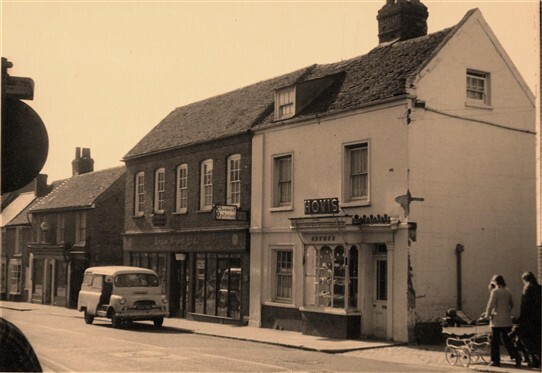 To the slight left of the van in the photo was Roughton's Bicycle shop which had a busy repair shop at the rear.